Signed in lower right: "Joh. Bernhard Fischers d?Erlachen". ------------------ Sheet: 312 x 433 mm; lead pencil, pen, brown ink and grey wash / paper. slightly stained. ------------------------ Johann Bernhard Fischer von Erlach (1656-1723) designed Schloss Klessheim around the year 1700. 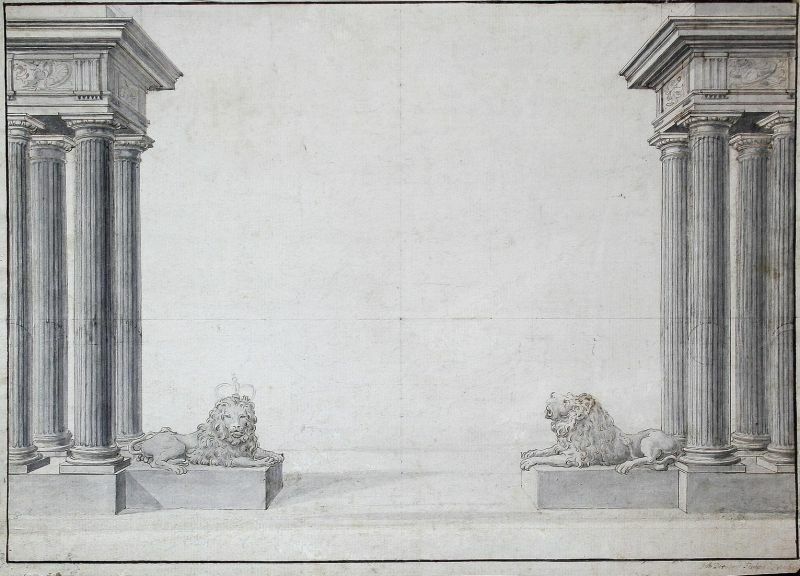 The present previously unknown drawing is the only source attesting Fischer?s creatorship of the two lion sculptures, today standing in the garden of Schloss Mirabell in Salzburg. Two very similar lion statutes were created for the Schönbrunn Palace in Vienna, most probably also after Fischer?s designs. The creatorship of both pairs of lions was previously unknown. ------------------------------------ In 1690, Prince-Archbishop Johann Ernst von Thun purchased the small aristocratic estate and the Kleshof manor house. In 1700, he commissioned Fischer to expand the manor house and construct Schloss Klessheim. The present design depicts two groups of columns flanked by two lion statues representing the heraldic animals of the prince-archbishop. The construction of the palace was interrupted following the archbishop?s death in 1709. His successor, Archbishop Franz Anton von Harrach, cancelled work in favor of Schloss Mirabell. Schloss Klessheim was completed in 1732 under Archbishop Count Leopold Anton von Firmian, who replaced the lions with his own heraldic figures, two deers. Fischer?s discarded lion statues were instead used by the architect Franz Anton Danreiter (1695-1760) for the newly-arranged garden of Schloss Mirabell, where they remain to this day. 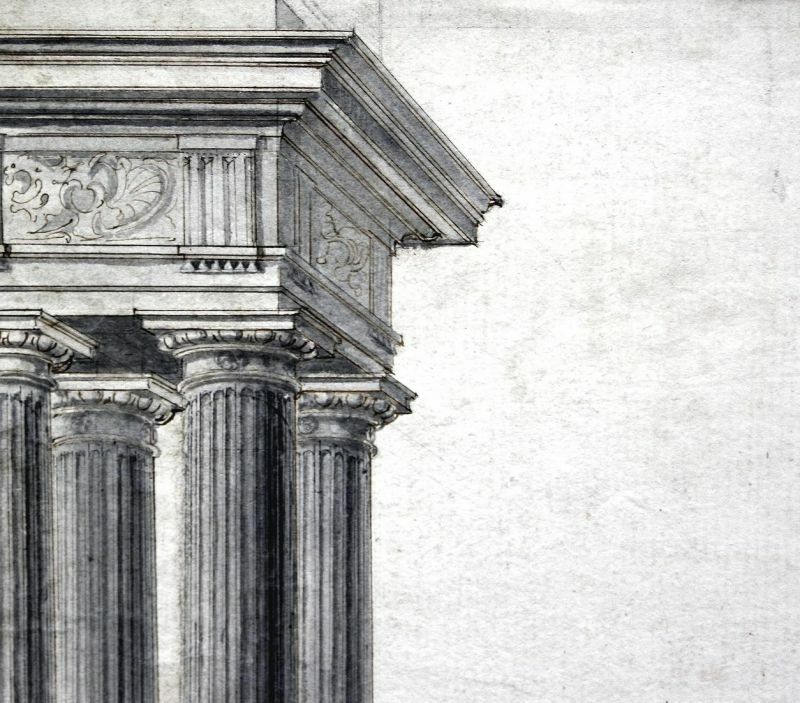 On top of both groups of columns, Fischer originally placed two Sphinx sculptures, which can be seen on another design for Schloss Klessheim (now in Zagreb), as well as on plate XVII of book IV of Fischer?s Historische Architektur. 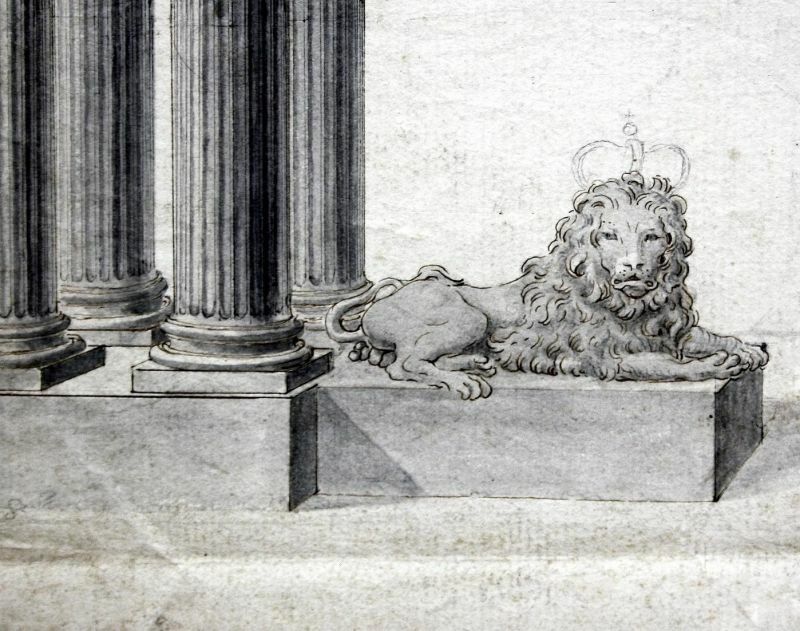 The present drawing draws attention to the lions only indicating the pedestals of the two sphinxes. In contrast to the lions the sphinxes have not been preserved. 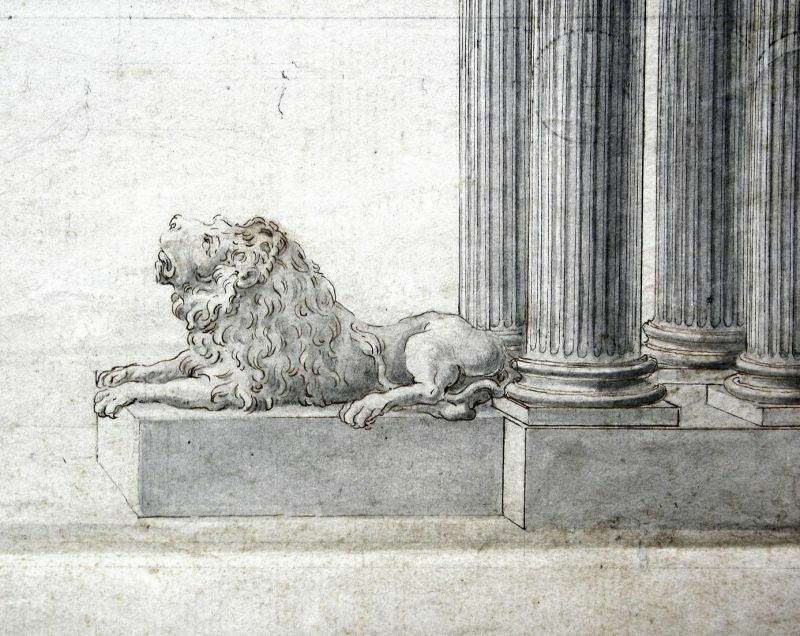 The present drawing is not the only time Fischer used lion sculptures in his designs. A few years after planning Schloss Klessheim, Fischer produced the plans for the Böhmische Hofkanzlei in Vienna, where he placed a lion statue on the roof. Around 160 drawings by Fischer?s own hand still exist, the vast majority not signed, and only a handful in private hands. 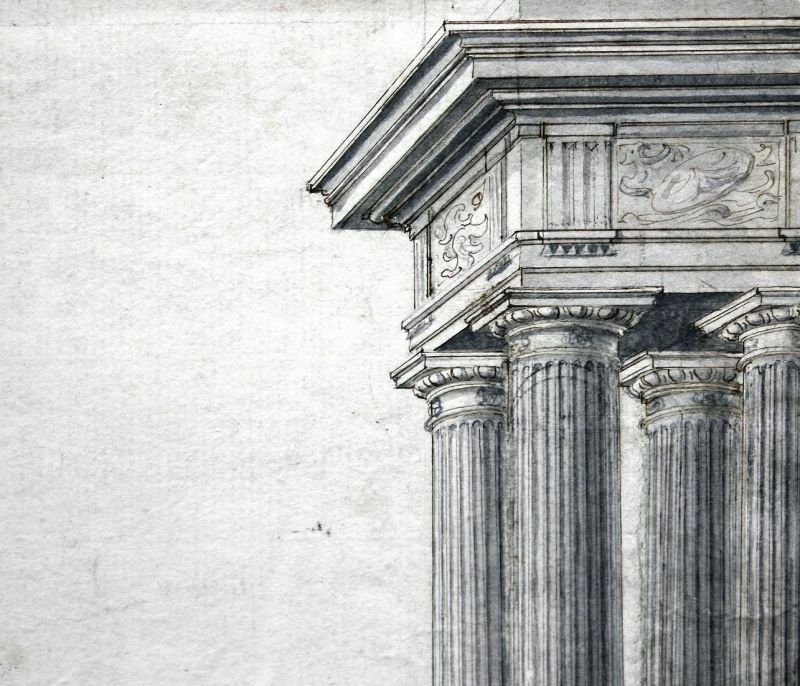 Drawings by Fischer are very rare on the market. We were not able to trace another drawing by him for several decades.----------------------------------- Literature: Hans Sedlmayer ? Johann Bernhard Fischer von Erlach. Stuttgart, 1997; Andreas Kreul ? Johann Bernhard Fischer von Erlach. Regie der Relation. Salzburg, 2006; Thomas Zacharias ? Joseph Emanuel Fischer von Erlach. Vienna and Munich, 1960; Peter Prange ? Entwurf und Phantasie. Zeichnungen des Johann Bernhard Fischer von Erlach (1656-1723). Salzburg, 2004.